Editor’s Note: This commentary by author Carina Magyar is part of our special focus on LGBTQ issues in the month of June. Growing up, I gravitated toward fantasy books and games. Anything with magic, swords, dragons, and the fate of the world in it was good for me. I wasn’t “allowed” to read the mystery and romance novels I also gravitated toward. As someone assigned male at birth, I was repeatedly taught that I shouldn’t enjoy books “for girls,” so I read my Nancy Drew books secretly, stolen off my sister’s shelf. I read my mother’s romance novels under my covers and carefully replaced them on her desk in the morning, bookmark right where I found it. But fantasy, I could read in the open, and the really good ones always featured enough mystery and romance to keep me going. I wanted to take Damian’s outline for the story—and fully-fledged visual realization of this magical world—and give it a plot that would shake off gender orientations. We quickly settled on a dual-protagonist structure, with a prince and princess sharing equal spotlight in the action. The target audience was too young for romance, but in its place, we substituted a strong theme of family bonds, sibling love, and the importance of always trusting and supporting your kin. All that remained was a real mystery, one that would not only provide the plot, but color it at every step. I don’t have the wherewithal to dissect what it is about mystery that appeals so strongly (and seemingly disproportionately) to women. As a transwoman and mother to two daughters, I spend a great deal of mental energy wondering why things are “supposed” to appeal to girls or boys, but I usually throw my hands up and just accept that there are certain inevitable (probably cultural) pulls that draw our genders in different directions. I gave up fighting my girls’ choosing pink as their favorite color. Why fight a color preference? Doesn’t that label it as inferior? And I gave up trying to figure out why they decided that Teenage Mutant Ninja Turtles was gross and unappealing, while My Little Pony was amazing. I noticed, while reading them stories, that anything suffused with mystery, any question with a solution revealed at the end, really lit their minds up. If I had boys, like Damian, I may have noticed a similar mysterious light going off in stories about conflicts overcome. And while I want to declare gender silly and a dead concept, my time around children has taught me to be more gentle, to allow that the culture of gender identity seeps in and works its ways. I’ve learned to listen to my children, and when they do express a desire or opinion “contrary” to their gender, encourage them to explore it rather than hide it. We all contain multitudes. Children are best nurtured with variety. If I was going to work on a project aimed at children, I was determined to provide that variety, and counteract the constant gender divide kids encounter in children’s entertainment, toys, clothes, and … everything, really. Our story already had plenty of fights and conflicts and puzzles – they are deeply endemic to the fantasy genre after all – but by layering on a mystery of why the kingdom was wasting away, and whom these unseen villains were, I saw that we could balance the fantasy forces. Just as the pages are literally split between male and female protagonists, the energies of the story are driven equally by male and female themes. Ideally, these themes start to feel neutral, appealing to any reader. The hope is that any child – regardless of the gender they were assigned at birth – will light up as the story unfolds. This, to me, is the essence of bringing transgender experience to writing. It is easy – and not a bad thing! – to simply and overtly insert transgender characters into a story. But I didn’t want our book to be pigeonholed as an activist book, or an LGBTQ book. I wanted to appeal to children who are themselves floating in the gender spectrum, show them that the world is wholly theirs, and not cordoned off into “allowed” and “not allowed” interests. The goal is not to erase gender, or become blind to it, but to embrace gendered curiosities and blend them into the stories we tell ourselves. In short, I co-created a book I would have loved as a child. I hope some children see the spark buried in there, just for them, so they can love it, too. 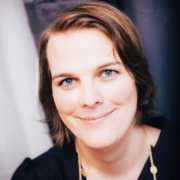 Carina Magyar is an author and journalist living in Austin, Texas. She has two daughters, aged 5 and 3, and also dabbles in stand-up comedy. She has won numerous awards for her writing in both fiction and nonfiction. For The Kingdom will be her first children’s book. 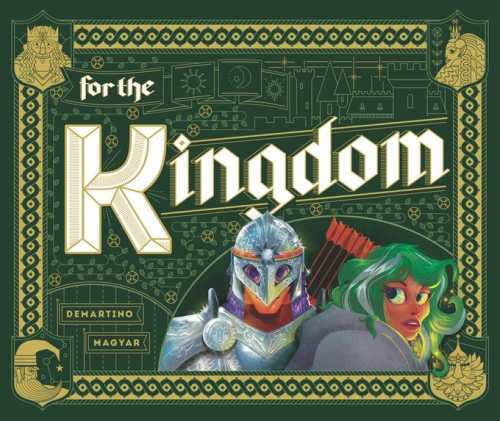 For the Kingdom was financed through a campaign on Kickstarter and will be available soon. Keep up with updates on the book here.